In the epic fourth audiobook of The Forsaken Saga, Nora comes face to face with the elders for the first time. With Hunter and the angels at her side, she will try to do that which no one has done: Destroy the elders and break their terrible reign of power. But it will not be easy. The elders have held on to their posts since the first memories of the Vassiz. Will prophecy be enough to guide Nora against them? Exciting and Satisfying Conclusion to Forsaken Saga! 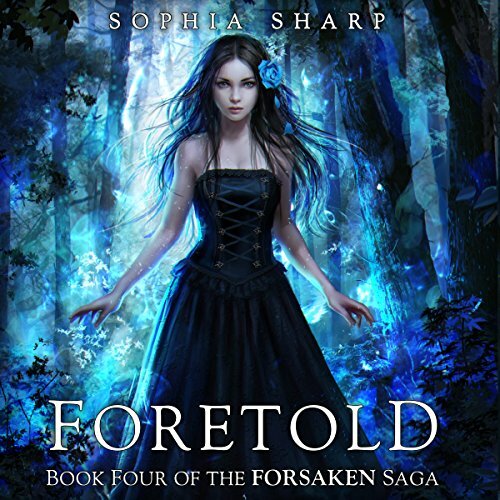 Foretold by Sophia Sharp is the final book in the Forsaken Quartet, and is a fitting conclusion to this action adventure fantasy. Nora and Hunter, Alexander and Morgan, and 4 of the Angels have a showdown with the 8 Elders in the Dreamworld with one purpose in mind - to destroy the Elders and put an end to their corrupted leadership over the Vassiz. Thankfully this book brings many characters and issues full circle and explains all unanswered questions left from the first three books, including Nora's true parentage. As with the other books in the series, Pam Lorence narrated and did an outstanding job! She had different voices for each character, all of which were very believable. She also portrayed action sequences in an exciting and exhilarating way without becoming shrill. Pam's narration definitely contributed to my enjoyment of this book, as well as the entire series. Highly recommended!